The holidays can be difficult for people in multiple ways, but I think the most common are financially and emotionally. The holidays bring up a lot of old memories, family issues, childhood traumas and more. For many it brings up memories of family or friends that have passed, and makes for a very sad holiday. And then there is the issue of money. While most of us don’t think of money as an emotional issue, it can be. And the expectations of others, stress of overspending, and just comparing gifts (or amounts spent) sometimes can make people really miserable. In the US, our expectations around Christmas are pretty big. It’s a highly celebrated thing and everyone wants to know what you want for Christmas, and what you got for Christmas. People expect gifts, money, and recognition. And it can be a bit of a stressful nightmare for a lot of people. Personally, as bad as this sounds to some, I have never liked the Christmas holiday. For me, it’s always been about uncomfortable family events, disappointment, guilt, and so many other not-so-fun feelings. I remember as a kid not always getting what I wanted because my parents couldn’t afford it, and just not understanding that (or why). True for many children out there. Then as I got older, it became a bit sad, as my mom worked hard to get us what we wanted (and spent way too much on us) and my dad just didn’t participate or would get upset that we had all spent so much money. It was a holiday filled with guilt. Later in life when I was married, and hopeful I would like Christmas again, my ex wouldn’t buy me what I wanted and complained about everything I got him. So in a nutshell, I just don’t have any really positive memories around this holiday. I remember of wanting so badly to have the ‘normal’ Christmas that I thought everyone else out there was having. I wanted it to be a happy and fun time. But the reality was it was always miserable due to unrealistic expectations, overspending, guilt, unhappiness and more. Regardless, it has never been fun for me. As adults, my family just stopped it all. No gifts anymore – we just get together and have a meal. It is SO much better! I kind of wish we’d done that all along, though I know that would be hard to explain to children. The thing is, Christmas kind of puts a bad taste in my mouth now. I of course see the religious and spiritual side to it, and the family time, but the rest of it – the materialistic part – kind of makes me sad. It’s just not worth it. The crazy expectations our society sets up for us. The build-up, the let-down, the disappointment, the bad feelings. That’s what it represents for me in so many ways. I don’t decorate for Christmas, I prefer not to exchange gifts (as it often brings up those old feelings), and I definitely don’t want to go broke over it. The holidays can really mess up your sense of value, self-worth, and feeling loved. 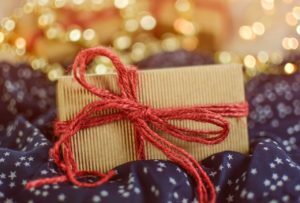 I think from a young age when we don’t understand money, or where our family is at financially – we don’t see that gifts are frivolous and overtaxing people’s budgets. There are a lot of people out there that go broke or deeply in debt over the holidays just to make their family and friends feel valued, and really, it’s just not worth it. Love does not only need to be demonstrated in material ways. I think if we could all just be grateful for one another. Maybe doing acts of service for each other would be a better way to show our love? I kind of love the idea of doing selfless things that don’t cost a cent but really help those around you. Or at least let’s exchange a very small but meaningful gift, or even give gift certificate for an act of service for one another. A gift that shows me that you really know me and see who I am, or at least that you really support me in my life. Personally, I’m trying to find some peace with the Christmas holiday. I have never decorated or bought anything Christmas. I don’t put up a tree or do anything special. Any ornaments people may have given me are in a box somewhere, and many I’ve just gotten rid of. I don’t think there is anything wrong with that though. If it doesn’t make me feel good, why give in to the pressure to decorate and celebrate? And I haven’t even touched on the loneliness of this holiday yet. I think the holidays can be the loneliest time for many. Especially if you don’t have family to gather with, or even co-workers or close friends who can celebrate with you. It can be downright miserable to spend a holiday alone at home eating frozen pizza and ice cream and feeling sorry for yourself. Been there, done that. I don’t think I’m alone out here either in some of these feelings. I can only imagine that others have had challenges around this holiday in their life and may not look forward to it either. Maybe you are still paying off the gifts you bought last year, and the year before that? Perhaps you have also been subject to the crazy emotions of guilt, disappointment, sadness and more? You can change it all though. You can find peace with this holiday season, regardless of what, or even if, you celebrate. It’s like anything else in our life. We need to work through our past issues with it. We need to be honest about our feelings and then move forward through them. You can always do things a new way and feel new feelings. Talk to people about how they feel about the holidays. Do your friends and family enjoy it, or do they feel emotionally or financially challenged around this time? Can you see that they are stressed? What could you do to alleviate that in some way (without doing the same to yourself) and make both of you happy? Perhaps helping them cook the family meal would be better than a gift? If you don’t want to exchange gifts with people, offer up an alternative– just spending time together is usually a great one in our busy world, but some other ideas would be: have an exchange with friends – bring clothing or other items you no longer use, and have your friends bring the same – everyone can take home the things they want (and the rest can be donated!). Or just have a party or holiday drop in. If you just want to spend time with one particular friend, perhaps you could both write a card out for each other telling them what they mean to you, or what admirable qualities they have. That is something they will treasure for a lifetime! Keep it simple. Don’t buy into all the extensive décor, wrapping, or over-the-top holiday ideas. Get creative with your gifts, your decorating, and your wrapping. Even brown paper bags from the grocery store can be decorated to make cute wrapping for a gift. There are lots of great ideas that don’t cost a thing. Unless you’re someone that is holiday crazy (and those people probably stopped reading this article a while back), keep your holiday décor simple and hopefully reusable or recyclable. Think about and express your appreciation for those in your life. Really that’s what the holidays should be about. Be thoughtful about what you do and what you say, and spend time with those who matter to you. Those things will be more meaningful than any gift you give. It’s a time to see the good in humanity and honor that. Have some fun. Create fun moments for yourself and others. 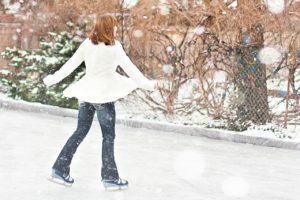 My fondest holiday memories are when we did something different and FUN! Like when my older cousins would get us out of the house (during family holiday gatherings) and take us ice skating. Or when my family decided to take a winter hike after our Christmas dinner around the neighboring ponds through the snow. Make sure to do fun things that pull you out of the holiday routines and make you smile! Honor those who have passed in some special way around the holidays. 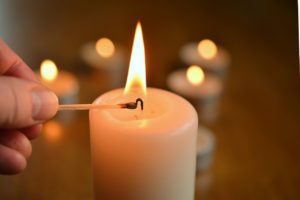 Even something as simple as a saying or writing a beautiful message for them and lighting a candle. It’s a beautiful time to honor those we’ve loved and lost, especially when they are in our thoughts and we miss them. Be gentle with yourself. The holidays can get nuts. Between holiday parties, gift exchanges, time with family, and sometimes a roller-coaster ride of emotions – it can be overwhelming. So make sure to give yourself quiet, space and breaks as much as you can. Something as simple as a quiet night with soft music and a hot bath by candlelight to re-fuel yourself. Whatever fills your soul and helps you to rest and relax. 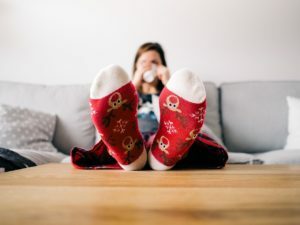 Don’t change your self-care routine.Sometimes people throw it all out the window in December because of the food, treats, parties, travel to see relatives, and more. It’s easy to say ‘screw it’ and plan to fix the damage in January. But it’s actually incredibly important not to do that for your own health and mental well-being. A few treats should definitely be consumed, but don’t change anything else. Keep the exercise, self-care and otherwise good eating up. Have a plan. 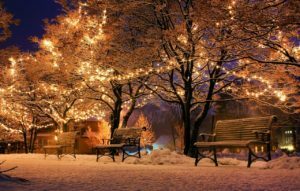 Know who you are spending the holidays with and what you will do to make it a pleasant and happy time for yourself. If you don’t have anyone to spend time with, reach out to your social circle and see who will be free? Maybe there are others in the same boat? See if you can find people who will be positive and fun who you can be with. One year I had a friend with a broken wrist who couldn’t drive home on Christmas eve, so we went out for Indian food. It turned out to be such a fun night! Don’t put so much emotional emphasis on it.Some people feel at times that being alone or even just feeling happy on a holiday such as Christmas is a huge deal. It can be devastating to be alone, or at a miserable family event. However, I think we need to put it in perspective. It’s really just another day. Don’t give it so much weight and emphasis. That’s really how I’ve dealt with it better in recent years. It’s just another day! It’s really a matter of finding peace with it all though, and of course looking for the good in it. I’m learning to do that with this holiday. To find the beauty in the chaos so-to-speak, and to patiently, gently, lovely let go of the past and find a new enjoyment of it my way. We need to remember to be compassionate and understanding with others, and with ourselves. And the holidays are a great time to start.